BH EnergyGap will be submitting a new planning application this winter to develop a Resource Recovery and Renewable Energy Production Facility (The 3Rs) at Fryers Road, Birchills Leamore, Walsall. The UK has landfill reduction targets and there is ever more pressure on business to ensure its waste is properly recycled and processed and not sent directly to landfill. There is, therefore, a real shortage of facilities to support the local business community in avoiding sending its waste to landfill. This facility will safely process waste. Materials, such as metals, plastics and rubble, will be sorted and segregated to recover their value for onward recycling using the latest sorting technology such as magnets, eddy currents, near infrared cameras and air jets. The residual materials will be used to produce energy using advanced thermal treatment. 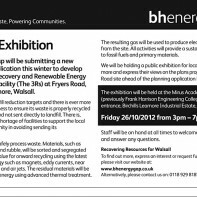 The exhibition will be held at the Mirus Academy school, (previously Frank Harrison Engineering College), Willenhall Road entrance, Birchills Leamore Industrial Estate, Walsall on: Friday 26/10/2012 from 3pm – 7pm.